Immunohistochemistry (IHC) is a molecular assay that involves the use of antibodies to detect specific proteins within tissues on microscope slides. These proteins are visualized with a colored chromogen and viewed with a Brightfield microscope. IHC can be used to detect a single protein in tissues or antibodies can be multiplexed to detect two or more proteins on one slide. Multiplexing is an excellent way to view how proteins are interacting together within the tissue or to view several different cell populations at once. The first and most important step in any histology procedures, including IHC, is fixation. Typically, tissues are fixed in 10% Neutral Buffered Formalin (NBF), processed and embedded in paraffin; formalin-fixed, paraffin-embedded (FFPE) tissues. The length of time tissues are in fixative isn’t critical for routine H&E and special staining procedures; however, it is critical for IHC. Formalin causes cross-linking within the proteins of tissues; these cross-links can mask the epitopes which need to be available to bind to antibodies in IHC procedures. Over-fixation can render the tissues unusable for IHC. Ideally, tissues for IHC should be fixed for 24-48 hours, and then transferred to 70% ethanol until processing, embedding and sectioning. Although over-fixation of tissues can result in un-breakable cross-linking within proteins in tissue, optimal formalin fixation will also form cross-links. These cross-links can be removed with a procedure called antigen (epitope) retrieval. The two most common methods of antigen retrieval involve the use of heat or enzymes. Heat-induced epitope retrieval (HIER) involves superheating the slides to temperatures of 90°C-125°C for up to an hour. HIER is done by placing deparaffinized and hydrated slides are placed in a buffered solution which is then heated up in a pressure cooker, microwave or steamer. Enzyme-induced epitope retrieval (EIER) is generally performed on hydrated tissue sections at either room temperature or at 37°C for 5-30 minutes. Once retrieval procedures are completed, the tissues are blocked for endogenous tissue elements which can interfere with staining or cause background staining. These endogenous elements can include: proteins, avidin, biotin and peroxidase. Once blocking is completed, the antibody is applied to the tissue. Next, antibodies are applied to the tissue sections. Irrelevant control antibodies of the same immunoglobulin isotype as the primary antibody are applied to a parallel set of slides. For example, if the primary antibody is a Mouse anti-CD3, isotype IgG2a; the irrelevant control antibody is Mouse IgG2a. The irrelevant control antibody is applied at the same concentration as the primary antibody. The isotype control antibody controls for non-specific binding of antibody to the test tissue. The antibodies are incubated on the slides for 30-120 minutes at room temperature, or overnight at 2-8°C. The next step is antibody detection. Detection is the step in which the antibody is bound to a reagent that will react with a chromogen. The detection is usually done with a secondary antibody that is labeled with an HRP (horseradish peroxidase) polymer. If the primary antibody is a mouse, than the detection step could be a Goat anti-Mouse HRP polymer. The polymer is generally applied to the slide for 30-60 minutes. After the detection step, the colored chromogen is added, and the slides are counterstained. The most common substrate chromogen is DAB (diaminobenzidine), which produces a brown color when catalyzed by HRP. Thus, the protein or cell of interest will appear brown on the slide. Although brown DAB is the most common, there are other colors available; such as purple, pink/red, blue, green and black. The slides are then counterstained with Hematoxylin, which stains the nuclei a blueish-purple. Slides are then dehydrated in ethanol, cleared in xylene and coverslipped with resinous mounting medium. Below is a summary of the staining steps involved in IHC staining. HSRL’s highly experienced team is proud to offer a broad range of routine and advanced IHC staining techniques for FFPE tissues. Numerous antibodies across multiple species have been validated in-house, including mouse, rat, dog, pig, non-human primate and human. 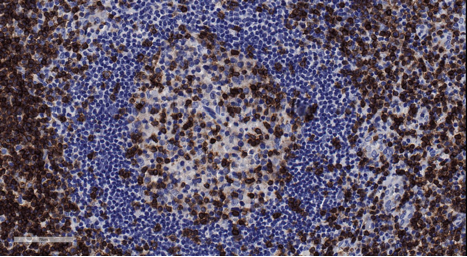 We offer single and multiplex IHC staining for all of your protein localization and co-localization studies. Our highly trained team of scientists can assist with your research goals by providing input regarding which IHC markers will be most effective for your studies. We are proficient with both GLP and non-GLP IHC method development and will optimize the antibodies that fit your research needs. We are happy to consult with you regarding recommendations for tissue collection and fixation procedures that will lead to the best possible staining results. Please reach out to see how HSRL can help make your study a success! We look forward to hearing from you.